If there are 2 Model T cars sitting side by side and they are identical except that one has a Ruckstell and the other has a Warford transmission which would you pick and why? I'd pick the one with the Warford because with it you get under, direct and over. With the Ruckstell you get direct and under. I guess lots would depend on whether they were original units or one of the newer varieties offered by Chaffins or Layne. If original, I'd take the Ruckstell. If my choice was one of the newer untis, it would be the KC Warford. That being said, both of the newer units are wonderfully engineered and manufactured options. New Warford or old. The Ruckstell shifts much more easily than the old Warford making it my choice for a car that I am going to drive. I don't know the context of your question John, but just for the record there are lots of other brand name choices to pick from. Muncie, Longbien, Jumbo Giant to name a few. Most are mounted immediately behind the planetary and a few are mounted just ahead of the rear end. I have 1 T with the new Layne Warford and 2 with Ruckstell's. The T with the Layne Warford has a 4 to 1 rear end. I like that combo. Lots of power in low and straight through. In over drive I still can out run the other cars on a tour. If the car with the Warford had auxiliary brakes I would pick it. If not I would go with a Ruckstell. As mentioned before the old Warfords can be very dangerous in neutral. Ruckstell over original warford. New warford over ruckstell. The original warford ratios are just not quite right for me. Aluminum case Warford is my choice over a Ruckstell any day. In fact, I'm thinking about taking a Ruckstell out of one of my cars. Had the Warford with a 4 to 1 in another car since 1969. The Warford or just a standard Ford differential is my choice. I have not tried the new Warford. 1. When we say "over" we mean it's an overdrive ratio. It provides a higher gear ratio and therefor more speed but less pull. 2. When we say "direct" it means the ratio doesn't change going through the unit. It's 1:1, so no change in power or speed. 3. When we say "under" we mean it's an under drive. It provides a lower gear ratio and therefore less speed and more pulling power. I hope this helps. It can get pretty confusing, particularly when you factor in the planetary low and high speed ratios. 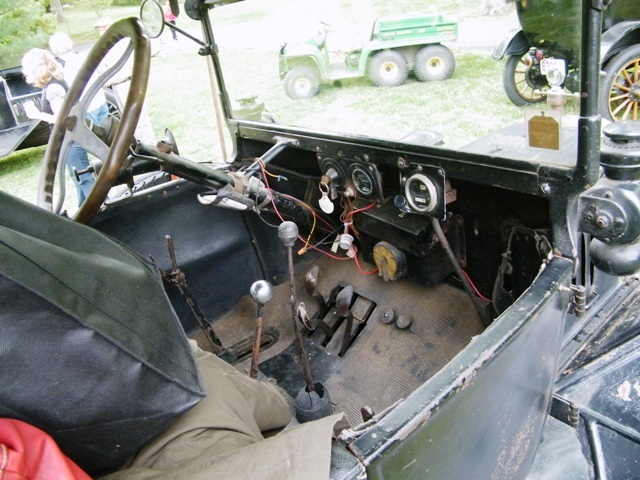 For example, I have a 3 speed with reverse Muncie (not all auxiliary transmissions have a reverse). This gives me 7 forward combinations and 5 reverse combinations. Each of the three Muncie gears can be used in planetary low or high, so that's 6, and you also get a forward combination from reverse/reverse, making 7 total. The planetary reverse can be used in Muncie 1st, 2nd or 3rd plus Muncie reverse in planetary low or high, for a total of 5 reverse combinations. Number one, your hypothetical case lacks too many important details for us to give a answer. Body style, weight of T, weight of load or how many passengers, engine power and mods, rear axle ratio and the most important, what you plan to use the car for. Point two, don't get sucked into thinking the more money you spend on a T the better it gets, especially if you do not use your T for racing, off-road or as a daily driver. You don't need a Warford or Ruckstell to drive to Starbucks for your weekend soy decaf Frappuccino. Having a Warford or Ruckstell can be a big plus but your starting point should be asking yourself why do I need one. Thanks Henry, that helps. Also, to Constantine, good question, "Why do I need one?" Our '14 is stock and is great on the road with a 102 year old engine, just don't go as fast. The good thing about "not going so fast" is that I enjoy driving the Model T and if I go faster then my enjoyment is cut short. I really do enjoy 25 MPH and looking around. Seems that going 45 in a Model T could be a bit sporty? Haven't ever done that however. Anyway, great forum, thanks for all the comments. This guy had a Warford and a Ruckstell. Thanks Royce, that sure is a busy lookin' cockpit. Neither! A good running, well balanced, T should be able to pull most any hill in high and do 50-60 mph all day. (Just ask the Montana 500 participants). Yes, I have Ruckstells in 4 of my 5 T's, but use low only when stuck behind a slow running car going uphill. You shared, "If the car with the Warford had auxiliary brakes I would pick it. If not I would go with a Ruckstell. As mentioned before the old Warfords can be very dangerous in neutral." Auxiliary brakes are an added safety feature for any T. But I believe they are critically important for one with an auxiliary transmission or two speed rear axle. My 14 roadster drove quite nicely with no ruckstell. Unfortunately on club runs the guy in front of you with the aux transmission or ruckstell sets the pace and you can end up riding the low pedal instead of just driving up a hill. So now it has a ruckstell and rockies. Stock rear end is in the shed. There's more to it than just a well balanced well running engine. I have two T's with standard Ford rear axles which will pull a 6% grade at about 25 mph. I have another T with a 3-1 rear axle. That one will go about 30 mph up the same grade, however when it slows to 25 I need to use Ruckstell. So the problem is not just the other T's shifting into Ruckstell but it is also the gear ratio as well as the weight of the car. which determines the best speed for pulling a hill. I have never used any other auxiliary transmission than a Ruckstell so can't say which one is better, but with the Ruckstell there is less modification of the original Ford parts. Looking at the photo Royce posted above makes me think of a TT I once saw. It had a Muncie behind the planetary, a "direct and over" unit (can't remember the brand name) on the drive shaft just ahead of the rear end, and a Ruckstell. I can't even calculate all the various combinations. I think it took two guys to drive it! Yeah Harold. That's for sure. My truck has the low ratio rear end. In low/low you almost need to sink a post to measure movement. Adding a Ruckstell low would mean you could point it in the right direction then go have a sandwich. Not much will happen while you're gone. I'm redoing my TT and adding a cast iron Warford to the already existing Ruckstell rear end. It will definitely take some getting used to! Now, all the discussion about "no brakes" somewhat concerns me, but no one ever seems to mention that the handbrake will still work. It's not the strongest, but I've stopped my tourer from fast speeds with it with no issue. Does anyone have pics of the foot throttle you're using? There are differing opinions about driving a T or TT equipped with an auxiliary transmission and/ or a 2 speed rear end absent outside auxiliary brakes. You're right, the handbrake will stop you. However, many of us don't believe the handbrake to be a viable choice in a panic situation. I personally believe auxiliary brakes are a MUST with any of the aux gear boxes. I don't have a foot throttle. Frankly, I don't want one. There are already too many things for my feet to do. I don't believe it's difficult to learn to shift using the hand throttle. I hate to put a damper on things, but ANY auxiliary transmission should also have brakes operating on the rear wheels. I have a friend who recently bought a Model TT truck that had been modified with a shortened frame that was just long enough to have an engine followed by a Muncie, followed by a Warford hooked up to a TT Ruxtell axle. It has auxillary brakes on the rear end. Right now it is not running. We just took the head off of it today and saw that the engine is stuck because of rust and needs to be rebuilt. I can't imagine it going much faster with a running engine! I agree with what Tony said. But I would also recommend that all T's have the rear wheel brakes too. Any break in the drivetrain from the universal joint to the axle shafts can put the standard T equipped with transmission brake in freewheeling. I used to have a Ruckstell and a Warford in my car. I got tired of the input shaft on the Warford wearing, so I took it out, and have been driving with a Ruckstell ever since. No regrets. The Ruckstell has a large ball bearing thrust which is a plus compared to using a conventional rear end with the Warford. My TT has a Lincoln (over-under- straight) with a Ruckstell and has a top speed of 19 MPH but will climb a tree. In planetary high you should be able to get about 19 MPH with the Ruckstell and the Lincoln in direct, and that's with low ratio rear end gears. This would be the same as if there were neither the Ruckstell or the Lincoln. Seems like you should do better when you shift the Lincoln into over. I don't have a Ruckstell, but with low ratio rear end gears and a Muncie I can get a little over 30 MPH in Muncie 3rd/ planetary high. Are you sure everything is working properly? A TT with low speed rear end gears and an overdrive should be capable of 25-30 MPH if everything else is OK.
As to the original question, the Ruckstell is easier to shift but the Warford more versatile. I have both in my dump truck and they work great together. It's really a good idea to have auxiliary brakes with either one. If it were me and I was going to install one over the other I think I would go with the Warford. I was doing some work on a speedster, the guy wanted to install both units, I talked him into just the Ruckstell in that case. I've been behind that guy on the tour that had the Ruckstell, mine does not, him just moving along, me in low all the way up the hill! On a clear road I can usually make the hills in high without ether as long as I don't get slowed down or they are realllll long. My TT wound up as fast as it would go with low-speed gears, an old cast-iron Warford, and a Ruckstell will hit 28mph in high/high/high. Good running stock engine with timer and well tuned coils... screaming though, with those straight-cut Warford gears and a metal cab you need earplugs on a long trip. 22-23mph is far more comfortable. Running in Warford direct is WAY quieter, but way too slow for anything longer than a few miles at a time. For my Touring, I intend to put a Layne Warford in it. I live in a pretty flat area where overdrive would be pretty useful. The Warford needs to be supported properly and aligned properly or it can cause crankshaft breakage. There was a fellow on the O - 2 - O ride that broke several cranks on the way, likely because the Warford was not aligned properly. And Larry Smith talks of the input shaft wearing (repeatedly) indicating something. It is essential that the cast iron Warford be supported, however rarely hear of the aluminum getting support. In reference to Royce's picture: what kind of gearing does having both a Warford and a Ruxtell give you? Could be that people are hooking up the "CAST IRON" Worford without the proper parts. While the input shaft will slide into the tail shaft and the Warford will mount up without the in between housing, it needs that housing and the proper u-joint. The in input shaft on the Worford is smaller then the hole in the tail/output shaft. The u-joint takes up the play and flex between the two.